Herbs are a common to almost any dish served in a restaurant, either as part of the dish or a garnish. Here on Guernsey we’re incredibly lucky to have access to some of the finest herbs available, grown locally in a former tomato vinery in St Sampsons. Being further south than the rest of the UK and benefitting from a milder climate, Guernsey has a long history of cultivating vegetables, fruit and flowers for the UK market, and Fresh Guernsey Herbs not only supply the majority of the restaurants and shops in Guernsey, but also export to the UK markets. 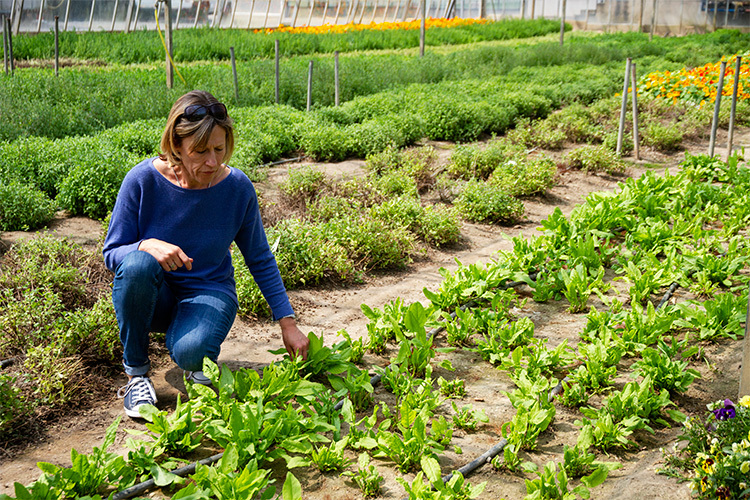 This summer we visited Fresh Guernsey Herbs for a tour of their impressive site with Selena, the daughter of the company’s founders, and then caught up with manager Seigi to find out more about this local artisan producer. 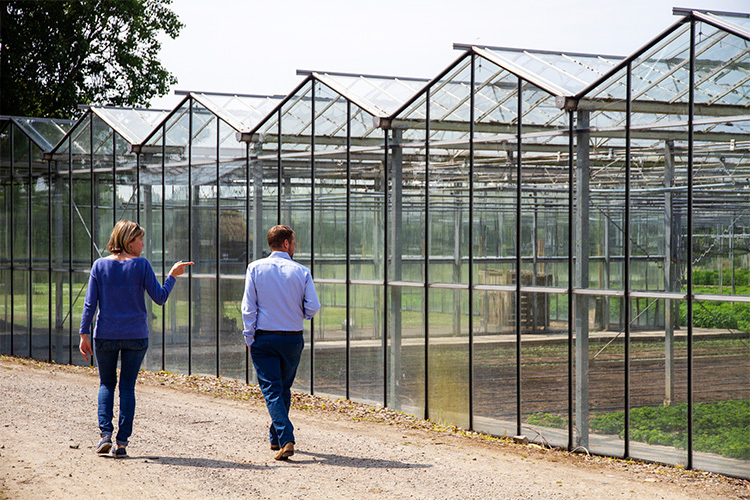 I’ve been involved for thirty years this year, but the business was founded by Sue and Ian Lloyd, and Simon Falla, as the Lloyd’s looked to transition away from growing tomatoes as that industry declined here in Guernsey. Lots of tomato growers went into flowers, growing roses, carnations and freesias, and it became a big industry. Ian and Sue experimented with growing other vine fruit like kiwis before Sue came upon the idea of growing herbs and persuaded Ian that they should give it a go. She had been marketing tomatoes in the UK and so she had good contacts for selling fresh produce. Back then, things were a little different – she spoke to one vendor at the Sheffield market and told him she’d be growing herbs and his response was “what, parsley?” so the public’s perception of fresh herbs has definitely developed since then! How many different varieties of herbs do you grow? We export 30 different varieties. Our top ten best sellers are chives, mint, dill, basil, coriander, rosemary, thyme, sage, tarragon and chervil. We also grow rocket, which is classed as a leaf more than a herb but which is also very popular. What are the more unusual herbs and plants that you grow? Lots of different types of mint, such as pineapple mint, but also garlic chives, lemon balm, and some varieties like that. We don’t grow as much of those, but they’re still important additions to our offering. 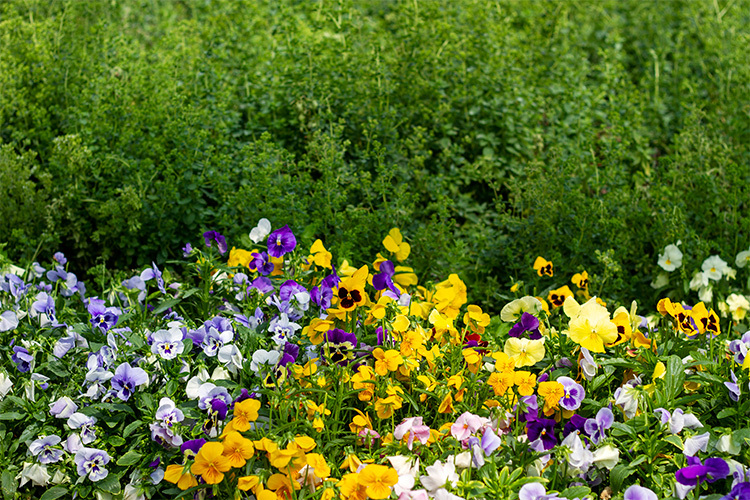 We’ve always grown 3-4 varieties of edible flowers – the market for thses had had some peaks and troughs, but since cookery programmes like the Great British Bake-Off became so popular and have showcased the use of edible flowers for decoration, they’ve become a real hit. Certainly in the last few years we’ve had more and more chefs ordering them, particularly pastry chefs. Is everything that you grow edible, and for consumption, or are any of your products grown for the essential oils business? Yes, everything that we grow is edible and for the culinary herbs market. When we visited you, we were shown the steam engine that you use to sterilize the soil in your vineries. How does that work, and why do you use steam? Steam is a really environmentally friendly way to clean the soil and to control any weeds and bugs or pathogens that might have developed in the soil and that could harm our crops. 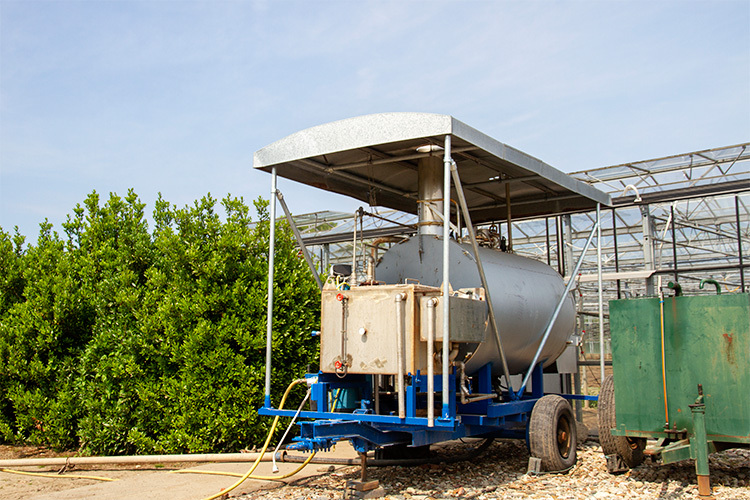 Although it uses fuel to boil the water for the steam (it’s basically a giant kettle), it allows us to avoid using any chemicals on the soil. Steam’s been used here in Guernsey for decades and was used by tomato growers, as it’s such a good way of sterilizing the soil. First of all we turn the soil over with a spade machine pulled by a tractor, to aerate the soil and allow the steam to penetrate. If we didn’t do that then the steam would bake the surface of the soil and it’d end up like concrete! We then lay a big sheet over the soil in the vinery, weight it down with chains and then pump steam under the sheet, leaving it to cook for about three hours. The steam penetrates about 3 inches into the soil. Herbs are delicate produce. What is are the processes and timeline between us placing an order and receiving a delivery of your herbs to the Bella’s kitchen, or to shop selves on the UK mainland? We cut herbs every day to order; for local chefs who place an order as you would at the Bella Luce, say for half a kilo of basil, that will usually be picked and delivered later that same day. For wholesale the herbs are sent out the next day after chilling. For local chefs on Guernsey we provide a facility for them to access the freshest herbs imaginable. 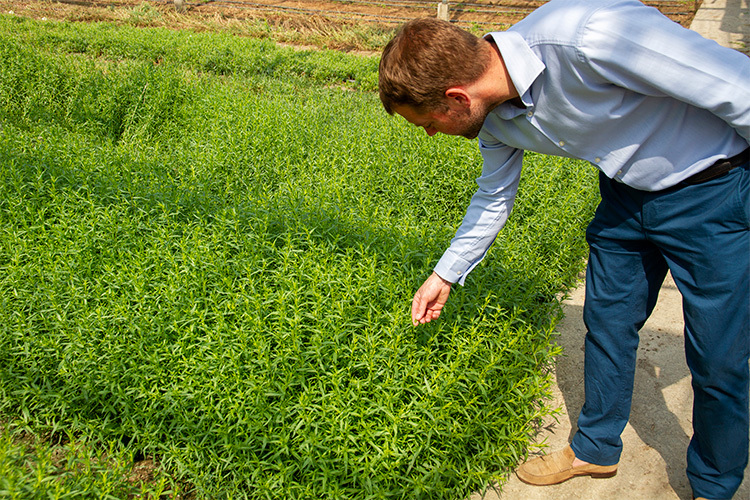 Without Fresh Guernsey Herbs, it would be difficult for chefs here to access really fresh herbs without growing them themselves, and that’s difficult to do well and at scale. 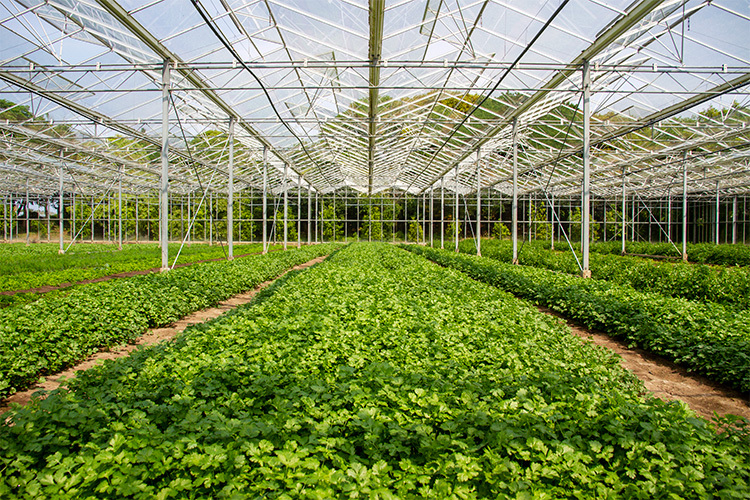 We grow coriander all year round, for example, and grow basil (which as a delicate Mediterranean herb normally has a fairly short growing season) between April and September. Local shops get herbs from us the very next day, six days per week, and our herbs are on shop shelves on the UK mainland four days after being picked. We picked and shipped two pallets of fresh herbs today (Monday), which will arrive in Portsmouth at 6.30am on Tuesday morning and be at the wholesale markets at Covent Garden and Hounslow in London, and at Bristol, Southampton, Manchester and Liverpool that evening. We send herbs to markets in Scotland twice a week also. Some of this produce is sold to small retailers such as delicatessens and specialist food shops, or to stall holders at farmers markets, whilst some of it goes to larger wholesalers who sell it on to restaurants. What’s your favourite way to enjoy the produce that you grow? That depends on the season. I do quite a lot of cooking and right now at this time of year we have some great mackerel available. I’ve got some fresh mackerel so tonight I’m going to take home some flat leaf parsley and chives and make a herb mix to surround the fish whilst it’s cooking. In winter, I’ll add rosemary, thyme and a bay leaf to a casserole, or make a Guernsey beanjar and add thyme and sage to that. Country Butchers also take some of our herbs, such as basil, and use them to make flavoured sausages. It all depends upon the time of year, and what’s on the menu! 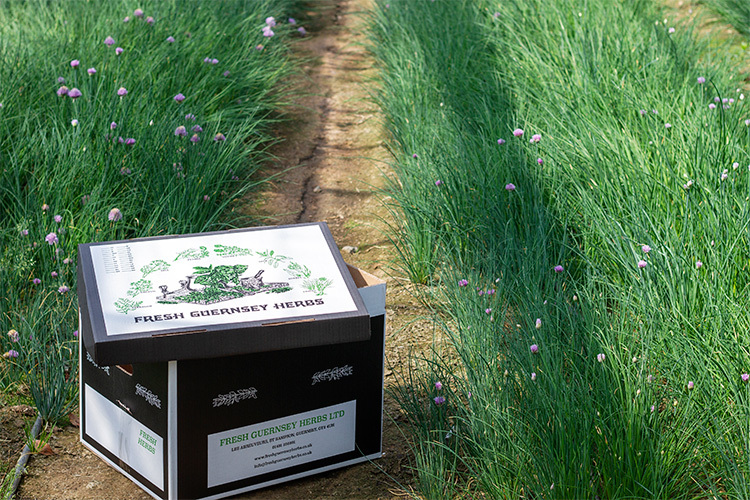 You can find and enjoy Fresh Guernsey Herbs here on the menu at the Bella Luce and at restaurants across Guernsey. You can also purchase packets in local shops, or keep an eye out in your local specialist food store or delicatessen if you live on the British mainland.